We are very excited to share an opportunity through our partner’s at TalentWatch, an innovative brand that could very well change the way music artists are discovered. Two areas that will jump out at you when you visit their site are their TV Show and Online Music Competitions. You have the chance to appear on TalentWatch’s TV Show simply by uploading your music videos (as well as a personal video) to TalentWatch’s website. In regards to music competitions, TalentWatch has ongoing music competitions for artists around the world. TalentWatch is a wonderful resource that can help emerging artists launch their career. Simply register and upload your videos for a chance to be featured on their TV Show. White Sun, a band based out of California, has won a Grammy for Best New Age Album for their album White Sun II. White sun is an IHM artist that uses dropkick to report their sales. Final Drive released their new album, Dig Deeper, earlier this month to debut on many charts including Heatseeker Albums. 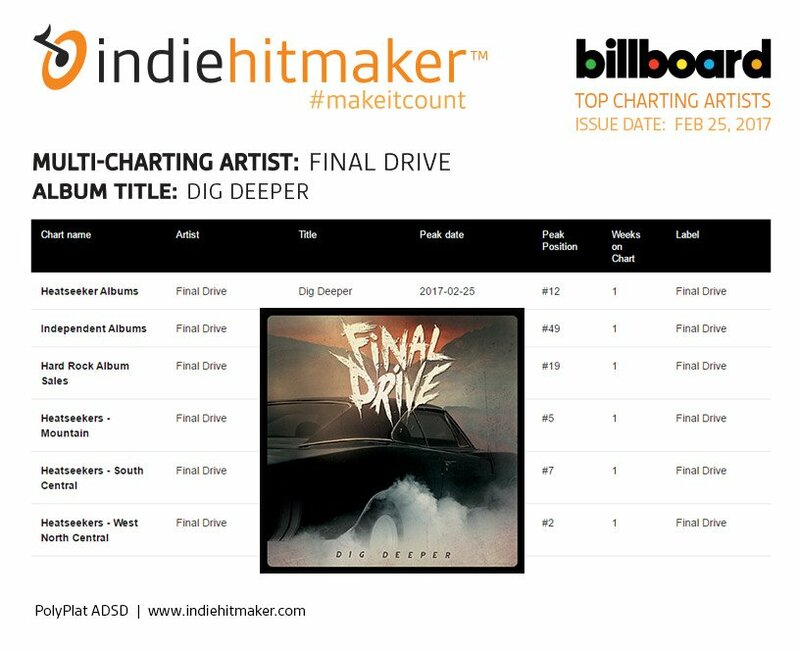 Final Drive charted by reporting all their sales – online presales, live show sales and digital music & merch bundle sales by making it count with Indiehitmaker. Bobby Washington’s song titled, Boo R U Ever Satisfied, hit the charts once again. Making it into 2nd place on the Hot Singles Sales Chart for the 4th week reporting direct-to-fan sales. Tropakana hits the number one spot once again on the Hot Singles Sales chart. His sale were reported using IHM’s dropkick.